Aside from legal considerations, there are good reasons why you shouldn’t overpower your fishing kayak, and they all boil down to one word: Safety. Simply, overpowering any boat, including a kayak, is hazardous, weather because the extra torque and speed make the boat harder to control to a point where the driver could lose control and capsize it, or because a powerful motor can overstress the part of the hull to which it’s attached (typically the stern), and make it develop cracks that could cause the boat to sink. When common fishing kayaks are concerned, most online videos that show such a vessel driven while outfitted with a gas outboard motor reveal an overpowered setup – Those SOT kayaks are hard to drive mainly due to poor stability, unsuitable ergonomics and insufficient access to the motor’s controls. In some cases the kayak’s stern is dangerously low to a point where it’s partially submerged. As for Wavewalk kayaks, they work perfectly with small outboard motors, but in some cases their owners outfit them with an outboard gas engine that’s too powerful (I.E. exceeds 3 hp), mainly because these boats work better with outboards that feature a long propeller shaft (20″), and such motors are hard to find in the range of small-size motors. Needless to say that such outfit is hard to drive, and requires extreme caution. Inexperienced drivers should not drive overpowered boats, especially such small ones. First, make sure the boat is properly outfitted with enough flotation. This may turn out to be critical in case of an accident. Remember that the more powerful the motor the heavier it is, and that in case of an accident, the amount of flotation you use should suffice to keep the boat afloat with the motor attached to it. Second, make sure the motor mount you use is sturdy enough – Remember that the motor mounts offered by Wavewalk are rated for 2.5 hp to 3 hp, and they won’t withstand the torque generated by more powerful motors. Note that the TMM 20-15 mount featuring in the above video was reinforced with a double mounting plate. Reinforcing the knobs under the deck with wide plates is recommended as well. While a spray shield isn’t required for driving your motorized Wavewalk on flat water at regular speed, it’s pretty useful when you drive in choppy water and at higher speeds. The same is true for a cockpit cover. The current trend in fishing kayak design is to produce kayaks that are increasingly wide and heavy, and no longer qualify as car-top boats but rather as microskiffs or small boats that require a trailer. This defies the purpose of kayak fishing, but some anglers opt to purchase and use these boats. The question is, how practical is it to motorize these excessively big kayaks? It turns out that most large-size fishing kayaks can be outfitted with electric trolling motors that are mounted either on the side or in the middle of the kayak – right in front of the user. It’s not the most practical setup, but some anglers need this extra propulsion power to get where they want to fish, or get back from there, since paddling long distances isn’t for everyone. Some are outfitted with an electric motor mounted in the back, at a big distance from the driver, which isn’t very practical when you go in shallow water where weed and grass are commonly found, and these tend to get entangled in the propeller. As for outboard gas motors, we haven’t found a single fishing kayak that offers an acceptable solution for an outboard gas motor, as such motors must be stern mounted due to their weight, and mounting a motor that far behind the driver doesn’t work well, for various reasons related to steering, convenience and safety. 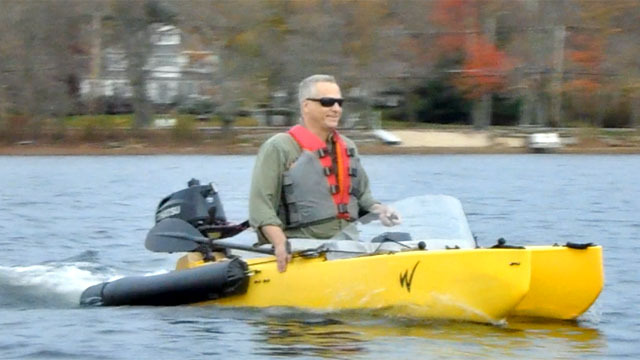 The only fishing kayak that can be flawlessly motorized is the Wavewalk, as we’ve already mentioned here. With its new, black, inflatable side flotation modules, the new W570 INF 20-15 looks like a rigid-inflatable boat (RIB), which is a type of boat commonly associated with high speed and rescue operations. The new transparent spray shield makes this little boat look like a marine motorbike, or a twin-hull personal watercraft. Being able to drive this microskiff while standing is not just a useful feature – it’s a lot of fun. Being able to launch it almost anywhere, without needing to use a boat ramp is a huge plus, and its light weight makes it easy to car top – There’s absolutely no need for a trailer for this craft. Interestingly, the spray shield is detachable, and it can be removed within seconds if you find that it’s in your way when you fish – After all, this boat offers its user to fish from the front, and not from its sides. In sum, we see a noticeable upgrade in what Wavewalk offers in the market for portable fishing motorboats. This short review of recent kayak design articles highlights some aspects of the common fishing kayak. The first, and probably most striking thing about the typical SOT, sit-in or hybrid fishing kayak that’s offered in stores or online is its size – It is huge, and consequently heavy and hard for one person to carry and car top, as well as hard to paddle, especially in wind and current. Those kayaks seem to have crossed the line between a kayak and a boat, or a skiff, since practically speaking they require transportation by trailer. And indeed, some manufacturers already refer to their larger fishing kayak models as boats, not because of their performance or some additional functionality, but due to their size. Needless to say that this fact alone is evidence that such kayaks defy the purpose of kayak fishing. The second most striking aspect of those large-size fishing kayaks is the dysfunctional clutter in their cockpit and deck that seem so crowded with fishing accessories and just ‘stuff’ that the angler sitting or attempting to stand in them literally has no room to do so. These objects range in size, from small cup holders to large size lean bars, and their presence in the kayak’s cockpit is not only unnecessary to the angler, it is clearly counterproductive. The third interesting thing about these larger than life (I.E. too large for real people to fish from in real life) kayaks is the absence of hydrodynamic design in them: They are not even close to conform to basic boat design standards or even to common sense: Not only are they much too wide for their length, which slows them down and makes them track poorly and require a cumbersome rudder – their underside features a variety of design elements that are extremely counterproductive as fare as speed is concerned. Such elements can be multiple scupper holes and molded-in channels, fins, and even a skeg. 1. Poor ergonomics, meaning mainly lack of comfort, early fatigue and back pain, as well as bad bio-mechanical design, which the angler feels as a restricted range of motion in both paddling and fishing. The new beach seat style kayak seats are obviously a botched attempt to address this issue, as foam filled seats failed to do so in the past. 2. Insufficient stability albeit the fact that these fishing kayaks are extremely wide. 4. These kayaks are as wide as canoes and as as sluggish and unfit for paddling in strong wind, waves and other real world factors. 5. With all the stuff tucked on board a typical SOT, sit-in or hybrid fishing kayak, such craft still scores very low in terms of storage, as one or more hatches address neither the need for enough storage space nor for adequate accessibility to the gear stored inside. In contrast, the Wavewalk 500 series of twin hull kayaks offers a high level of fishability in all these factors. 2013 hasn’t been much different from previous years as far as fishing kayaks are concerned. The kayak obesity trend keeps being the main one, and it drives kayaks to reach titanic proportions. For example, kayaks that are 35 inches wide and weigh 80 lbs are almost typical, and a kayak that’s over 40 inches wide is no longer viewed as an aberration despite the fact that paddling such a kayak is quite a challenge, and almost impossible to do for medium and long distances. Leviathan barge kayaks weighing around 120 lbs are still considered as kayaks (at least by some) although even a seasoned weight lifter might find it hard to car top one, and people who buy them have to buy a trailer to go with them, which is yet another way to defy the purpose of kayak fishing. Fishing kayak hulls keep featuring all sorts of weird longitudinal channels and vertical dimples that work perfectly to create more drag and by that further impede the kayaker and make it harder for them to paddle. The infamous scupper holes that were introduced as means to prevent the deck from collapsing but have since been hyped as drainage holes keep conducting water in both directions, which means they also drive water up and onto the deck, and into the paddler’s area. In the twilight zone, kayaks with integrated outriggers are still being offered although the concept has proved to be rather useless in practical terms. It seems like the failure of the kayak industry to present kayaks that actually work for stand up kayak fishing drives more people to try outriggers. New designs still appear on the scene, and they make one wonder if kayak designers have any ability to learn from others’ mistakes. Pedal driven kayaks are still being promoted as the panacea, although reality has disproved most of their manufacturer’s claims as far as practical usefulness is concerned. Kayak storage keeps relying on hatches, which are often inaccessible to the user while they’re out there in their kayak, trying to fish from it. Such hatches have an annoying tendency to fail to be waterproof, and that’s bad news for your sandwiches! When ergonomic design is concerned, manufacturers seem to realize that the kayaks they offer are really uncomfortable, so they keep trying to come up with new ideas for seats, although it’s the seat itself together with the L sitting position that cause the back pain and leg numbness problems that so many anglers experience. And last but not least, fishing kayak manufacturers keep competing with each other by offering an increasing range of useless accessories, from cup holders to stand-up metal frames and stand-up ropes and straps… The latter being pure exercises in futility, at least from the user’s standpoint. No wonder the Wavewalk 500 keeps being the most loved fishing kayak out there! Sometimes a design offers more than the eye meets. In this case, a patented fishing kayak offering unrivaled stability and comfort as well as unmatched storage space and dryness can turn into a self-motorized water skiing device by virtue of its small size, light weight, ease of use, and tracking capabilities. Just drive around, standing up, with no motorboat to tow you… And you don’t need to be an athletic youth to perform this trick and enjoy it. The middle aged guy demonstrating the kayak in this video is 6 ft tall and weighs 200 lbs. The basic model of this rotationally molded Polyethylene W kayak weighs 59 lbs. The 2 hp Honda outboard motor weighs 29 lbs, and the transom motor mount adds five more pounds to the total. The driver controls the motor and steers the craft through the tiller handle, which is outfitted with an articulated (jointed) tiller extension allowing for effective steering even when the driver is standing up. This little wonder fits on top of any car rack, and inside some medium and large size vehicles. It’s easy to carry just by dragging in on the ground by a strap attached to its bow, as demonstrated towards the end of the video clip. Is this an effective solution for offshore trips? It is, and a simple and effective cockpit cover would provide additional protection from spray. 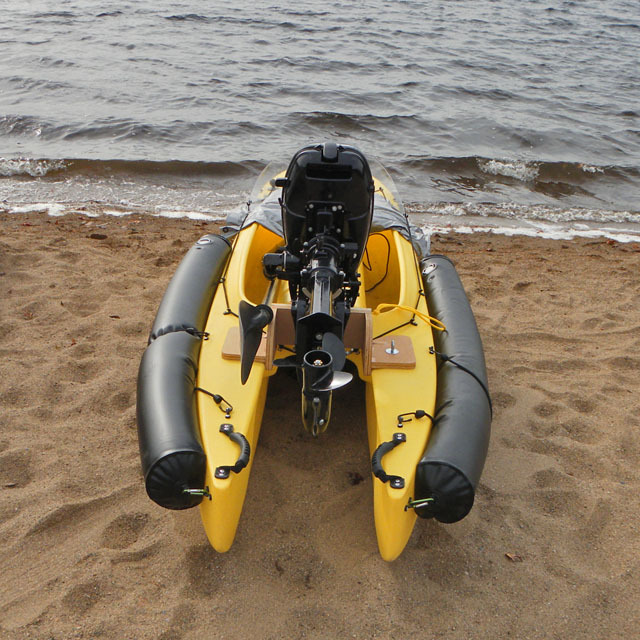 This watercraft can be outfitted with detachable flotation modules that would keep it afloat in case of a capsize accident leading to much water getting inside. The more traditional ways to look at this small boat are either as a motorized fishing kayak or a personal microskiff. The difference between the two viewpoints is related to whether you’re used to fish out of a kayak or from a motorboat.